Digital Learning Day was started in 2012 as a way to share and highlight how teachers include digital resources and applications to enhance student learning. How can your class participate? Check out the resources by visiting the link below. Plan learning activities that include digital learning on February 22nd. Take pictures/videos and share to social media with the hashtags #DLDay and #OPSProud. Include a mention of @opstechtrainers in your Tweets and Facebook postsand we will spread the greatness! Interested in learning more about technology opportunities such as ClassFlow? 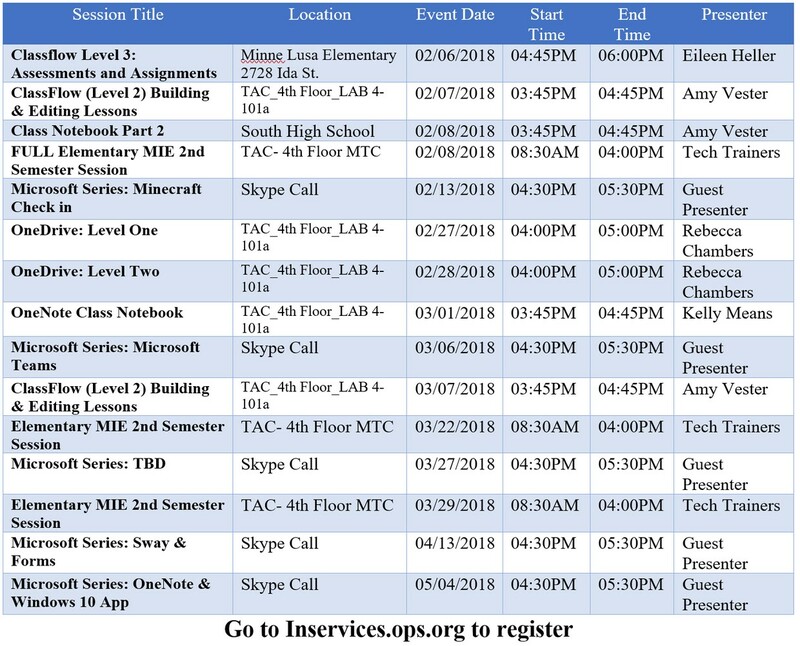 Below is a list of sessions you can sign up for on inservices.ops.org. Use your district e-login as the username and your employee number as the password. These training sessions are open to elementary and secondary school teachers and stipends for attendance will be paid when offered during non-duty hours. A sneak peek of the technology training opportunities are also pictured below. Check inservices.ops.org regularly as NEW training sessions are added often. **Remember, the A+ Curriculum Guides located in our Library Services notebook, include built in learning goals for the skills in the pacing guide sections. You can also refer to Section 2 of the Best Instructional Practices Handbook for additional guidance.